The changes seen in marketing over the last century have all been refined through the input given by customers; fundamentally, today is no different in our digital cloud and mobile computing world, yet what businesses can now see about their customers and target audiences redefines integrated marketing; the results are simple and effective. Naturally, when businesses start to gain traction in the digital marketing world, the refining process will begin; the end result is up to the vision of the brand, whether raw or smooth, edgy or refined, amusing or stoic, etc. Integrated marketing brainstorms an idea, produces an ad campaign, and then shares a consistent message strategically across all marketing channels and mediums – according to the creative parameters defining the vision. Brands should avoid cookie-cutter processes and ideas, rather, creative license should be given until a unique idea is developed with group synthesis. The development of a routine and effective integrated marketing approach should be carefully considered; each ad campaign and brand effort is an important communication to the target audience. Essentially, brands should be patient through a refining process that's unique to their vision and value, in order to get effective and lasting results. "Integrated marketing puts the focus on ensuring that your message is consistent, regardless of the channel that is used as the vehicle to share the message." When executing an ad campaign, consistency is the keyword for effective integrated marketing. Acquiring the software and expertise to automate and expand digital marketing efforts is part of the refining process we touched on above, yet the tools or "vehicles" used are only as effective as the ad campaign's consistency. Getting the brand's message, logo, image, and/or storyline across to the target audience with a consistent message (brand value) will net loyal customers and gain positive traction on social media channels and reviews. Of course, the effectiveness will vary, yet if an ad campaign is chosen that sincerely reflects the brand's values and vision, then it will effectively attract a loyal customer base with similar values. From a solid base of loyal customers (now even more reachable with integrated marketing campaigns), brands can confidently set sail into the sea of opportunity. "So why not play to each individual channels strengths and design marketing for that channel specifically, rather than attempting to integrate all channels?" The answer is customers don't care enough to pay attention to all your different messaging, and by not using one clear communications strategy to amplify your brand, your message will simply be lost in the constant stream of content that all consumers are subject to every day." Again, the main tactic is consistency, gaining visibility and brand recognition throughout integrated marketing channels. 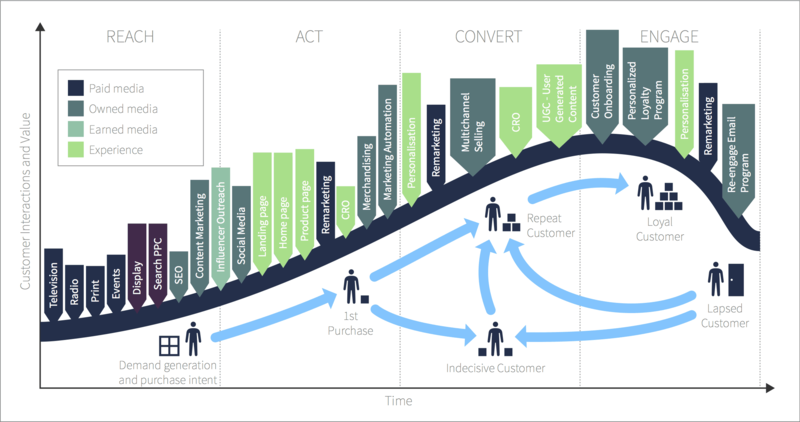 "To successfully integrate your marketing so all channels are pulling in the same direction, you need to plot all customer touch points with your brand across the customer lifecycle. This lets you form a list of channels you'll need to integrate and align with the same messaging." 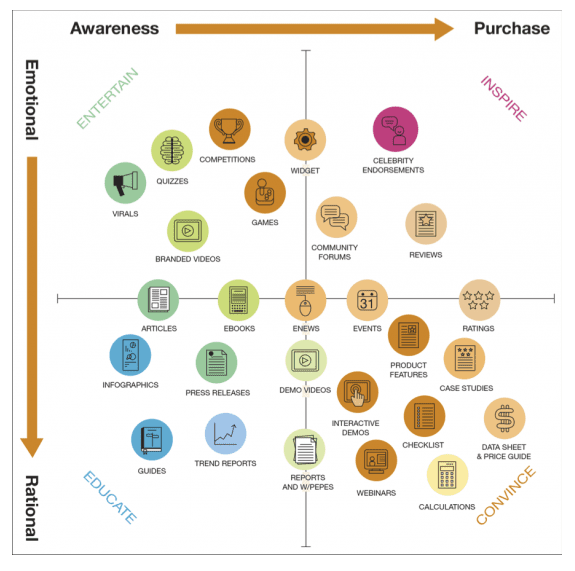 At the end of the article is Smart Insights' Content Marketing Matrix, which gives even more "...mediums which you need to assure the messaging is aligned across." Gaining visibility with effective tactics, when it comes to integrated marketing, means staying consistent with messaging across the spectrum of digital marketing efforts, and to align all marketing mediums with this consistent brand image and vision. Flexibility in the ad campaign's vision will produce a more sustainable storyline, yet this has to be tempered with visible and audible brand recognition themes; individual ad campaigns will constantly create a seamless storyline for brands to mold according to their vision's journey. Effective results are the end product of a refined integrated marketing approach, which is simplistic in nature: unify all digital marketing efforts with a consistent brand vision to gain online visibility and brand loyalty. In the process of learning about target audiences and how to reach them, brands can measure success with failures along the way. Essentially, brands want to communicate with consumers on a trusting friend level; this is where loyal customers who engage are located, yet any customer interaction is welcomed and nurtured to fruition. During the process of earning loyal customers, brands should embrace the negative feedback and results (failures) as part of the learning process. Measuring success from failures is a mental attitude that breeds pragmatic determination; this helps brands to persevere during failures with ad campaigns without disregarding the brand's vision or values. Retaining the brand's vision helps business's gain traction in online and offline markets, building success with a consistent and recognizable effort over years and decades. With the advent cloud and mobile computing technologies, B2C relations have drastically changed; brands have, nearly, unlimited data to develop marketing strategies with, and customers are being sought after and catered to more than ever. With changing customer expectations and rapidly advancing software options, brands are being challenged to forge ahead with confidence into the unknown. For brands, confidence this year means aligning digital marketing mediums with a consistent message; the results will be: refined integrated marketing that's simple and effective. Along the way, it would be wise for brands to consult and partner with expertise in digital marketing; this will accelerate the refining process and elevate their ad campaign's effectiveness. If interested in getting started please contact us today. Integrated marketing refers to the practice of using multiple advertising and communications channels in concert with each other. The strength of this strategy lies in the fact that most people get information from multiple sources. In the digital world, these sources can include one or more social media sites, search engines, news feeds, topic-specific sites, and more. By connecting with people through several (or all) of these platforms, as well as its own site, your company can make its messages more memorable than it could with any one outlet. The word "integration" is probably one of the greatest and most useful words ever invented. We know it works well in a social context when everyone actually applies the concept. In the world of marketing, it's also being used as a powerful new way to reach more people through multiple digital channels.